Reading Time: 2 minutes BarCamp facilitation is an un-invited, open un-conference like open space. Everyone can attend, all attendees are encouraged to present or facilitate a session or otherwise contribute to the event. BarCamp is a facilitation format I use frequently. A BarCamp is an un-invited, open un-conference like open space but has a less rigid structure. Everyone can attend, all attendees are encouraged to present or facilitate a session or otherwise contribute to the event. Attendance is typically free of charge and generally restricted only by space constraints. Participants are typically encouraged to sign up in advance. Venues typically provide basic services. Free network access, usually WiFi, is crucial. Following the model of Foo Camp, the venue also makes space for the attendees, or BarCampers, to literally camp out overnight. BarCamps are organized and evangelized largely through the web; anyone can initiate a BarCamp using the BarCamp wiki. The participants schedule sessions by writing on a whiteboard or putting a Post-It note on a "grid of sessions". Those giving sessions are discouraged from using the sessions for promotion. All attendees are encouraged to present or facilitate a session or otherwise contribute to the event. Everyone is also asked to share information and experiences of the event via public web channels and social networks. There is a real issue of concern with a need for a quick decision. There is passion (including conflict). 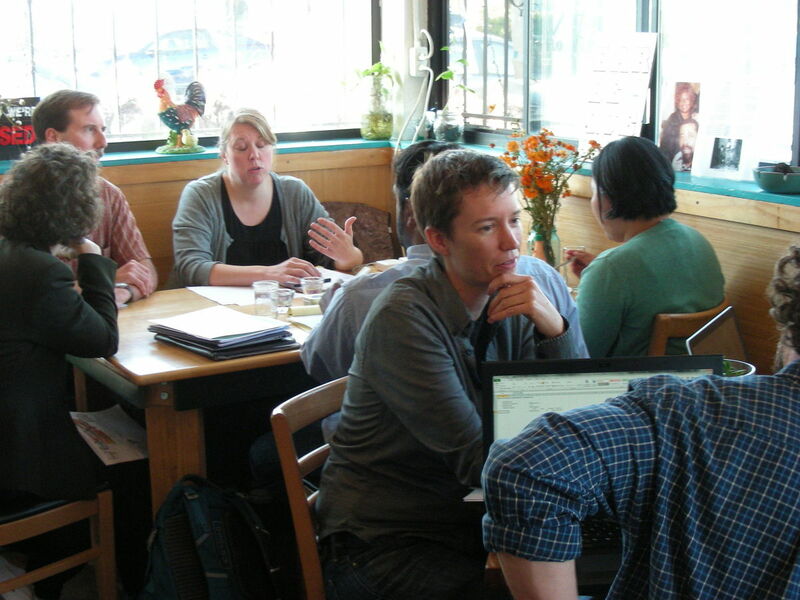 : Sustainable Economies Law Center, Janelle Orsi advising clients at the Resilient Communities Legal Cafe, via flickr.com, .